The Internet and the Web offer academic institutions solutions for covering the massive demand for education and transition towards student-centered, social constructivist educational models, in accordance with the demands of the knowledge-based society. This article reports on an investigation aimed at presenting a synthesis of recent research on the applications of Course Management Systems (CMS) in academic institutions, and evaluating the research directions and findings from a social constructivist perspective. The investigation explored current uses of CMS in academia, the impact of CMS on the educational processes, faculty and students, the differences among various modes of CMS-based online learning, and the extent to which CMS support social constructivist approaches to learning. It was found that CMS are currently used in a variety of disciplines for oncampus, mixed-mode, and complete online courses, yielding positive student attitudes and enabling faculty to create online learning environments of social constructivist inspiration. However, creating such environments by means of CMS still poses significant workload on faculty for structuring online interactions, and monitoring and supporting students. Furthermore, the facilities currently offered by CMS still refrain from effectively supporting alternative forms of assessment and collaborative knowledge building activities. Implications for the design of CMS are considered. Papastergiou, M. (2006). Course Management Systems as Tools for the Creation of Online Learning Environments:Evaluation from a Social Constructivist Perspective and Implications for their Design. International Journal on E-Learning, 5 (4), 593-622. Waynesville, NC USA: Association for the Advancement of Computing in Education (AACE). Retrieved April 20, 2019 from https://www.learntechlib.org/primary/p/6084/. Angelo, T. (2000). Transforming departments into productive learning communities. In A. Lucas (Ed. ), Leading academic change: Essential roles for department chairs (pp. 74-89). San Francisco: Jossey-Bass. Bennett, J., & Bennett, L. (2003). A review of factors that influence the diffusion of innovation when structuring a faculty training program. The Internet and Higher Education, 6(1), 53-63. Bostock, S. (1998). Constructivism in mass higher education: A case study. British Journal of Educational Technology, 29(3), 225-240. Chiang, G. (2002). What kind of support do they need? An instructional designer's experience in faculty and student support for online courses. Proceedings of the 30th Annual ACM SIGUCCS Conference on User Services (pp. 17-21). New York: ACM Press. Dede, C. (1996). Distance learning to distributed learning: Making the transition. Learning & Leading with Technology, 23(7), 25-30. Dougiamas, M., & Taylor, P. (2003). Moodle: Using learning communities to create an open source Course Management System. Proceedings of the World Conference on Educational Multimedia, Hypermedia and Telecommunications 2003,1, 171-178. Fetherston, T. (2001). Pedagogical challenges for the World Wide Web. Educational Technology Review, 9(1), 25-32. Firdyiwek, Y. (1999). Web-based courseware tools: Where is the pedagogy?. Educational Technology, 39(1), 29-34. Harasim, L. (1999). A framework for online learning: The Virtual-U. IEEE Computer, 32(9), 44-49. Harasim, L. (2000). Shift happens: Online education as a new paradigm in learning. Internet and Higher Education, 3, 41-61. Harasim, L., Hiltz, S., Teles, L., & Turoff, M. (1997). Learning networks: A field guide to teaching and learning online. Cambridge, MA: MIT Press. Hayes, R. (2000). Exploring discount usability methods to assess the suitability of online course delivery products. The Internet and Higher Education, 2(2/3), 119-134. Kandzia, P. (2003). Online courses step by step. In Klein, R., Six, H-W., Wenger, L. (Eds. ), Computer science in perspective (pp. 206-215). New York: Springer-Verlag. Kurtz, B., Parks, D., & Nicholson, E. (2002). Effective Internet education: A progress report. 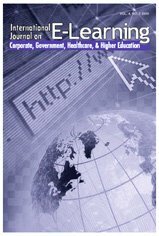 Proceedings of the 33rd SIGCSE Technical Symposium on Computer Science Education (pp. 312-316). New York: ACM Press. Linge, R. (2003). The good, the bad, and the ridiculous: Putting a course online with Blackboard. Journal of Computing Sciences in Colleges, 18(4), 355-364. McCormack, C., & Jones, D. (1998). Building a web-based education system. New York: John Wiley & Sons. Morss, D. (1999). A study of student perspectives on web-based learning: WebCT in the classroom. Electronic Networking, 9(5), 393-408. Oliver, K. (2000). Methods for developing constructivist learning on the web. Educational Technology, 40(6), 5-18. Reeves, T., Baxter, P., & Jordan, C. (2002). Teaching computing courses - computer literacy, business microcomputer applications, and introduction to programming online utilizing WebCT. Journal of Computing Sciences in Colleges, 28(1), 290-300. Scardamalia, M., & Bereiter, C. (1996). Student communities for the advancement of knowledge. Communications of the ACM, 39(1), 36-37. Schuler, D., & Namioka, A. (Eds.) (1993). Participatory design: Principles and practices. Hillsdale, NJ: Lawrence Erlbaum.